When I was writing the Learning Tree Windows Azure course, I was writing lots of code. As you might expect, things didn’t always go perfectly and tracking down the bugs was often difficult. I recall two issues that were the hardest to figure out. One had to do with an error in the configuration file. What made this hard to deal with was the fact that I didn’t get any errors when deploying the service. The service just didn’t work. I would upload the deployment package and configuration file, and then start the service, and it would just hang in this busy-initializing loop. The other bug was even more subtle. 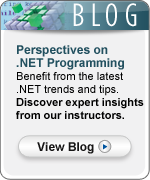 In the case-study, students create a Web site that uses a library from Microsoft that has custom ASP.NET providers for membership and sessions. They are simple to configure, and they seem to work fine when deployed to the cloud. Occasionally though, when using them on my developer machine, they would fail. The only way I could get them working again was to delete the membership table from developer storage. Simple right, well it took a while to figure out. I ended up finding a couple tools that helped me track down these and other errors. Both tools are from Cerebrata Software (http://www.cerebrata.com/). The first is Cloud Storage Studio. It allows for browsing Azure storage in the same way as browsing the file system with Windows Explorer. Using Cloud Storage Studio, it is possible to create and delete containers for blob storage and see the files in those containers. It can also be used to view tables and queues. It’s amazing how much easier it is to understand Azure storage, by simply visualizing it. It also makes managing Azure storage a snap. A screen shot of Cloud Storage Studio is below. The other tool I found useful was Cerebrata’s Azure Diagnostics Manager. 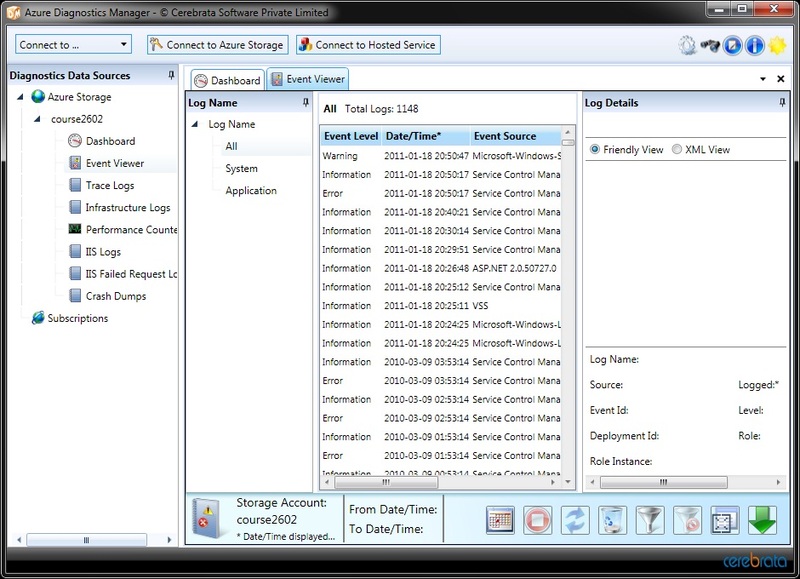 It allows for viewing of event logs, IIS logs, performance counters and so on. It is shown below. 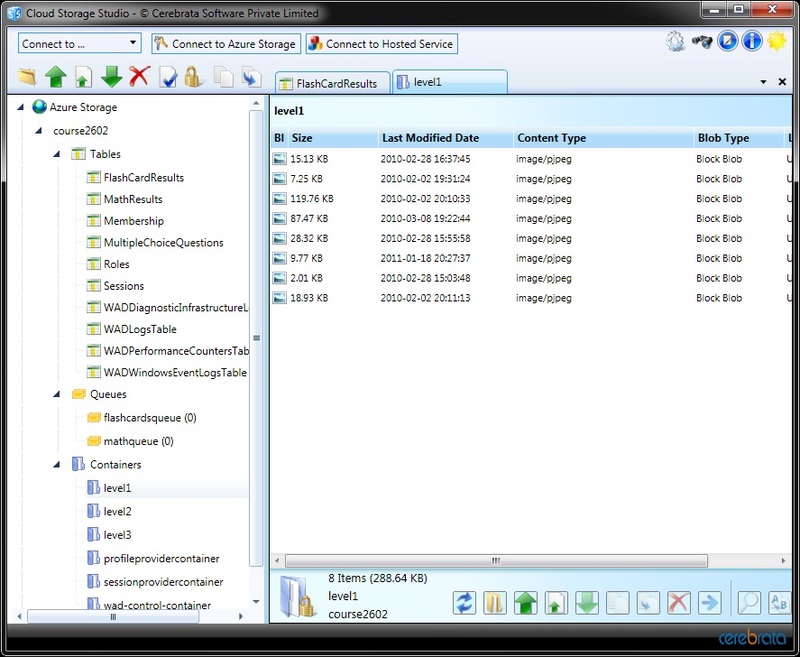 Cerebrata has a number of Windows Azure tools you might find useful. Check them out at their Web site, http://www.cerebrata.com/. I was grateful to find these tools when I was writing my Windows Azure course. The nice folks at Cerebrata also agreed to let me use their tools in my course royalty free. So, many thanks go out to them from me. If you want to learn more about Windows Azure come to Learning Tree course 2602: Windows Azure Platform Introduction: Developing Cloud-Based Applications. I recently commented on the Amazon AWS rapid rate of innovation. On a similar theme comes todays announcement of Amazon Compute Cluster instances for Amazon EC2. These instances are specifically designed for High Performance Computing applications and network bound applications. During a recent teach of Learning Tree’s Cloud Computing course, when discussing architectures, topologies and solutions for large scale computing the subject of using EC2 arose. One of the key questions raised by attendees was : how long would it actually take to commission such a solution on Amazon EC2 ? The answer to this question has now been significantly simplified with the launch of the EC2 Cluster Compute Instances. Cluster Compute Instances provide similar functionality to standard EC2 instances but have been engineered to provide higher compute and network capacity. They provide more CPU than any other instances and can be easily clustered to create the tightly coupled, low-latency compute facilities which can be up to ten times the performance of any current EC2 instance type. Amazon have a couple of excellent articles on the new features, available at aws.amazon.com/ec2 and also on running HPC applications. As author of the Learning Tree Cloud Computing course, keeping track of the latest innovations certainly keeps me busy, as does the resultant work to update the course to ensure attendees receive content that reflects the state of the art. If you would like to find out how your organisation would benefit from these innovations why not register for 3 enjoyable and informative days. You may never view IT in the same way after attending – and I mean this in a positive way ! Cloud Computing Promises: Fact or Fiction? Cloud computing is currently making information technology headlines, and vendors are aggressively promoting the many benefits it can provide organisations. These benefits appear so compelling that on the surface it seems all IT can and should be moved “into the cloud”. Upon closer inspection, however, for every benefit cited, questions can also be raised. This White Paper by Chris Czarnecki addresses the claims and questions that are often raised in relation to cloud computing and provides a clear view of what the cloud can—and can’t—deliver in reality. Download your copy here! I’m back in the UK after presenting the latest run of our new Cloud Computing training course. Although a new course, it has been extremely popular, keeping us busy since its launch. As author, after a teach its always good to reflect on the content and see how it can be improved. Attendee feedback plays a big role in this as does instructor experience. My feeling is that we have the course content pretty well balanced in that it meets the requirements of management wanting to know what cloud computing is about and also developers wanting to know how to develop for specific platforms. During the course, attendees get lots of hands-on experience with public clouds such as Google App Engine, Microsoft Azure, Amazon EC2 and Salesforce.com amongst others. One thing that I do believe the course could benefit from is a hands-on exposure to private clouds. With this in mind, I have arranged a meeting tomorrow with Eucalyptus Systems, to see how we can incorporate their private cloud into the course. Eucalyptus have some exciting new developments, in particular the new support for Windows operating system. With partners including VMWare, Hewlett Packard and Dell, Eucalyptus is a premium product. It is my firm belief that cloud computing will make a big impact on how organisations provision their in-house IT infrastructure, once the benefits of this approach begin to be realised more widely. Eucalyptus, being open source but also providing a premium enterprise edition appears to be perfectly positioned to provide a solution to this scenario and so would be a perfect addition to the products we provide detail on during the course. Maybe I will see you on one of our next sessions! Please check out our North American & UK schedules of upcoming sessions. The morning began with an in depth examination of Amazon’s EC2 offering. The IaaS Amazon offer is the most comprehensive currently on the market. Provisioning a server immediately from the rich Amazon catalog was illustrated when I demonstrated starting an Linux machine configured with Apache Web server, MySql database and PHP. Within 60 seconds the server was ready and I then demonstrated how to gain root access and start using the server. The cloud specific storage options such as CloudWatch, CloudFront and auto scaling were detailed. EC2 also offers a number of cloud scale storage options – often referred to as NoSql – were also discussed as well as the Amazon security infrastructure and its configuration. Interestingly, the cost of running all the course demonstrations on Windows and Linux servers, which included 11 hours of server running time, CloudWatch monitoring, different storage usage was $1.18 ! At this stage attendees now had an in depth knowledge of the architecture of the cloud and the various components that are provided as well as hands-on experience of working with these components and associated tools. The course then moved onto strategies for cloud adoption- how to define a strategy that minimises risk for an organisation. A number of scenarios from attendees work scenarios were considered and discussed. Some of the barriers to cloud adoption were also considered – and importantly how these barriers can be removed – innovative hybrid solutions that can meet regulatory requirements and leverage the strengths and benefits of cloud computing. Security and data location were primary barriers and the different levels of security were detailed. The course finished off with a look at application architectures for the cloud – migrating existing applications, developing new applications which utilise the new cloud libraries and hybrid solutions all of which can benefit an organisation. By the end of the course attendees were fluent in the technical possibilities the cloud offers and had acquired the knowledge to build a business case for cloud adoption which is pragmatic, acknowledging risks, but also minimising these risks for their organisations. How I am confident attendees have acquired these skills ? – the final course workshops had the attendees apply their knowledge to real world scenarios and their solutions provided clear evidence of the skills gained. Day two began with a comprehensive coverage of SaaS and some more hands-on work. We then moved onto investigating software plus services. A key feature of many cloud offerings is that they expose their functionality via Web services, either REST or SOAP style. Attendees spent some time analysing these service contracts. Examples included the Amazon EC2 WSDL contract. Moving through the cloud architecture PaaS was next. The offerings from Microsoft with Azure, Google with the App engine and Force.com were examined in detail. Attendees undertook hands-on exercises working with the Azure and App engine toolsets and seeing how applications are developed and deployed to the cloud. A demonstration by myself of developing an application with the Force.com illustrated a different approach to application development in the cloud – one that requires no programming skills ! The clean application development cycle supported by PaaS offerings from building through to cloud deployment were appreciated by attendees. An interesting question that arose from attendees was what level of control does a user have over tuning operating system and server parameters when working with PaaS ? It is this type of question that attending the course helps to answer. The exposure to a wide range of cloud technologies in a focused expert lead environment, really equips attendees with the skill set to make informed decisions on the appropriate way of implementing cloud computing for their organisations. “Cloud Computing Technologies: A Comprehensive Hands-On Introduction“. These courses will be available starting in April in our Education Centers, and online with Learning Tree AnyWare™. Please visit us again soon for updates on Cloud Computing featuring perspectives of expert Learning Tree authors and instructors!